Domaine de Pignan has quite a history in Chateauneuf du Pape. Antoine and Sophie Pecoul created the Southern Rhone Valley estate in 1855, the same year that the classification of the wines of Bordeaux took place. During the 1800’s, the property was known as Domaine Antoine Pecoul. The vineyard at the time was a 5 hectare parcel of vines. Since those early days, the owners have managed to triple the size of vineyards to their current 15 hectare size. Domaine de Pignan is a family owned property. It has remained in the hands of the same family since it was originally created and passed down to multiple generations of family members. Today, the estate is owned and managed by Frederic Charvin. Prior to 1960, the harvest was sold to negociants. In 1960, Domaine de Pignan began to produce, bottle and sell their own wine. The 15 hectare vineyard of Domaine de Pignan devotes 14 hectares to the production of red Chateauneuf du Pape wine. The remaining hectare is used for grapes grown to make white wine. A good portion of their Grenache vine, 3 hectares are more than 100 years old. 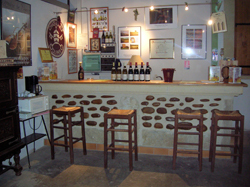 Domaine de Pignan produces 2 red Chateauneuf du Pape wines and 1 Chateauneuf du Pape Blanc wine. Domaine de Pignan Chateauneuf du Pape is made from a blend of 64% Grenache, 12% Syrah, 12% Mourvedre, 6% Cinsault, 2% Counoise, 2% Muscardin, 1% Vaccarese and 1% Terret Noir. The terroir is a mix of rocks, stones, sand, clay and limestone. The grapes are planted in the les Bosquets, Cabrieres, la Font du Pape, la Galimardes, les Mascaronnes, Mont Pertuis, Palestor, le Pied de Baud, le Tresquoys and of course Pignan lieux-dits. The wine is aged in old foudres, used French oak barrels and tank for 12 to 18 months. On average, close to 5,500 case are produced each vintage. Domaine de Pignan Coralie et Floriane is produced from 33% Grenache, 33% Syrah and 33% Mourvedre. The terroir is galets clay and sand. The vines are planted in three lieux-dits: les Bois de la Ville, le Bosquets and Pignan. The wine is aged in a combination of 25% new, French oak barrels, demi-muid and tank for 12 to 18 months. Not much of this modern styled wine is made as the production is only about 170 cases per year. Domaine de Pignan Chateauneuf du Pape Blanc is a blend of 40% Grenache Blanc, 20% Clairette, 20% Roussanne, 10% Bourboulenc, 5% Picpoul and 5% Picardan. 250 cases are produced each vintage. Domaine de Pignan can be enjoyed on the young side. Young vintages can be popped and poured, or decanted for about 1 hour. This allows the wine to soften and open its perfume. Older vintages might need very little decanting, just enough to remove the sediment. Domaine de Pignan is usually better with 2-4 years of bottle age. Of course that can vary slightly, depending on the vintage. In the best vintages the wine should be consumed within 3-10 years after the vintage. Domaine de Pignan is best served at 15.5 degrees Celsius, 60 degrees Fahrenheit. The cool, almost cellar temperature gives the wine more freshness and lift. Domaine de Pignan is best served with all types of classic meat dishes, veal, pork, beef, lamb, duck, game, roast chicken, roasted, braised, stewed dishes, sausage, grilled meats, barbecue and cassoulet. Domaine de Pignan is also good with Asian dishes, hearty fish courses like tuna, mushrooms, cheese, pasta, eggplant and tomatoes. The white wine of Domaine de Pignan is best served with a myriad of different seafood dishes, shellfish, crab, lobster, sushi, sashimi, chicken, pork and veal, as well as Asian cuisine. Domaine de Pignan Cuvee des Bousquets comes from blending 40% Syrah, 40% Mourvedre and 20% Grenache. The wine is aged in a combination of new, French oak barrels and foudres for 12 to 18 months. The production is small at close to 170 cases per vintage. Cuvee des Bousquets is no longer in production. At one time, Domaine de Pignan also produced a Cuvee Speciale from a blend of 40% Syrah, 40% Mourvedre and 20% Grenache. That wine has been discontinued. Lush, silky, long and sweet, the deep red, spicy, meaty fruits are perfectly ripe. There is good density, sweetness and complexity. The wine is made from 34% Grenache, 33% Mourvedre and 33% Syrah. Earth and garrigue are easy to discern, along with the elegant, soft, ripe, red fruits, silky textures and forward style that's loaded with kirsch from start to finish. The wine is a blend of 64% Grenache, 13% Mourvedre, 12% Syrah and other various allowable grape varieties. Soft, silky and fresh, the red fruits stand out, due to their purity. There is a fresh touch that gives it lift that is a good mix for the spice and pepper in the end notes. The wine is made from 34% Grenache, 33% Mourvedre and 33% Syrah. Light in color, medium bodied and open for early drinking pleasure, the wine is focused on its soft, polished, red cherry core of fruit. Not as complex as it is charming and easy to drink. Medium bodied, light in color, forward in style, with sweet, fresh, black raspberries, cherries, wild strawberry, ground black pepper and spice from start to finish. This is already fun in your glass. It is not a wine to make old bones, so drink it on the young side. A touch of oak in the opening notes, coupled with ripe, red fruits, soft, silky textures and a forward, kirsch filled wine in a refined style. Light in color, medium bodied, forward, kirsch filled wine. Fully open for business, the fresh red, bright kirsch, wild strawberry and peppery spices are on the nose and palate. Medium bodied, round and soft, this is not a wine for long term aging. So if you have a bottle, enjoy it over the next 5-7 years. Dark colored and fleshy, black raspberry jam, espresso and sweet, fresh cherries fill the supple textured finish. In a very modern style, which is going to turn off some tasters, others are going to enjoy the peppery, black raspberries, jam and coffee notes. The flashy style ends with a fat, oaky, ripe, kirsch finish. Round, ripe, lush, but perhaps showing a bit too much oak, for the level black cherry and kirsch fruit on display.